Are you ready to find some great books at a great price? 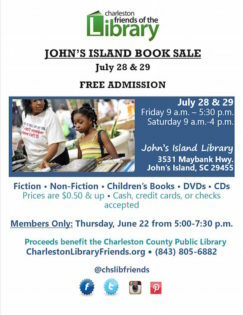 The John’s Island Book Sale, offered by the Charleston Friends of the Library, is just around the corner. On July 28 and 29 more than 10,000 books, DVDs, and CDs will be available at the John’s Island Regional Library. Prices start at $1 for paperbacks, $3 for hardback books, and $0.50 for children’s books. Last year’s annual John’s Island book sale raised more than $7,000, and the Friends hope to exceed that amount. All proceeds raised go directly to the Charleston County Public Library System to provide funds for items that cannot be acquired through the regular budget.